(ii) By Post for 800/- ( Eight Hundred only) for General/OBC Categories & 600/- ( Six Hundred only) for SC/ST Categories alongwith a self addressed e nvelope of 10" X 8" upto 19 th September, 2013. (iii) Fee is exempted for persons with Disability (PwD). (A) Age: He/She must have attained or will attain e the age of Seventeen (17) years as on 31 st December 2013. 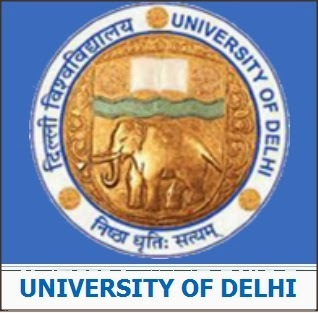 (B) FOR 85% DELHI QUOTA SEATS: The candidates must have passed XIIth Class (12 years course) or any other equivalent Examination recognised by the University of Delhi with 60% or more marks in the aggregate of three subjects i.e. Physics, Chemistry, Biology and has also passed English as one o f the subject from a recognised school conducting regular classes situated within the Na tional Capital Territory of Delhi (except Pri vate, Patrachar Vidhyalaya and Open School). While deciding the merit the marks obtained in English will not be taken into consideration. (C) FOR 15% All INDIA QUOTA SEATS: The candidates from all over India who have passed XIIth Class (12 years course) or an y other equivalent Examination recognised by the University of Delhi with 60% or more marks in the aggregate of three subjects i.e. Physics, Chemistry, Biology and has also pas sed English as one of the subject from a recognised school conducting regular classes (except Private, Patrachar Vidhyalaya and Open School ). While deciding the merit the mark s obtained in English will not be taken into consideration. Note: (i) The OBC candidates in order to become eligible for ad mission to BHMS course must obtain 54% marks in qualifying examination i.e. class XIIth examination. (ii) The SC/ST candidates in order to become eligible for admission to BHMS course must obtain 50% marks in qualifying examination i.e. class XIIth examination. (iii) The candidates belonging to Gene ral-PH must have secured a minimum of 55% marks, PH-SC/ PH-ST categories must have obtained a minimum of 50% marks and PH-OBC must have obtained a mini mum of 54% marks in qualif ying examination i.e. class XIIth examination. (iv) Provided that the student has passed all the subjects separately required for th e purpose of admission to BHMS co urse. (v) All the admitted candidates in BHMS course are requir ed to submit a Certificate that he/she has passed 8th Class Exami nation with Hindi. If he/ she is failed to submit the same certificate he/she will not be awarded the degree of BHMS course.